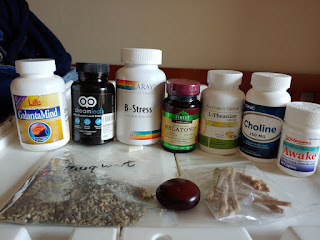 Here is part 2 of my article "Vitamins, Herbal Supplements and Probiotics for OBE". To read part 1, click on this link. I sometimes drink a caffeine drink (like a can of soda) in the evening, and it doesn’t keep me from sleeping. However, I’ve noticed extra lucidity and can often remember my dreams better when I do. For what it’s worth, Keith Morgan says to avoid caffeine,5 but my experience is just the opposite. Melatonin is a natural brain hormone you can buy in the United States as a supplement.7 Some people take it with caffeine right before bed for OBEs. The caffeine stimulates consciousness and the melatonin promotes sleep, and thus, conscious sleep. Consult your doctor before taking melatonin. Start out with 3mg right before bed, but beware: It may make you unusually drowsy the next morning. Never take melatonin before driving a car or operating heavy machinery, because it will make you sleepy. If 3mg doesn’t affect you, bump it to 10mg. If 10mg doesn’t affect you, try 20mg, but don’t go higher than that. If 10mg hits you too hard, you can also try a smaller dose. I haven’t experimented much with melatonin. Galantamine is a drug used to treat Alzheimer’s disease, because it enhances memory, but some people use it to induce lucid dreams. It is an acetylcholinesterase inhibitor (AChEl), which means it blocks the breakdown of the neurotransmitter acetylcholine, a molecule that supports memory. I’ve tried taking it twice and didn’t notice any effect. Some claim galantamine produces “poor quality” lucid dreams, but it’s better than none at all. Consider it a way to “jump start” the process. You can buy it as a commercial product called “Galantamind” which combines galantamine with vitamin B-5 and choline, a nutrient from which the brain synthesizes acetylcholine. There’s also a product called “Galantamind Plus” that contains a cocktail of other vitamins (including B-6 and B-12) as well as galantamine. It’s best to take one galantamine tablet in the middle of the night when you wake up before one of your last sleep cycles of the night. If you take it too early, you might have problems getting to sleep. Daniel Kelley recommends taking Huperzine-A with Vinpocetine for OBEs.10 Like Galantamine, Huperzine-A is used to treat Alzheimer’s disease and is a reversible acetylcholinesterase inhibitor that inhibits the breakdown of the acetylcholine. Do not take Huperzine-A if you’re on beta-blockers to decrease heart rate because it’s been known to reduce the effectiveness of common pulmonary and cardiovascular drugs.11 I’ve never tried it because I’m on a beta blocker. Another product you can buy for lucid dreaming is Dream Leaf. Each bottle contains several red pills and blue pills. (These are NOT the same pills as the movie The Matrix, but the manufacturer apparently wants that mystique.) The pills contain Mugwort, 5-HTP, Huperzine-A, Alpha GPC, Choline, and Bitartrate. To use dream leaf, take one red pill before bed. Next, use the WBTB technique (chapter 57.) When your alarm goes off six hours into sleep, you take the blue pull to induce lucidity and go back to sleep. I’ve only tried Dream Leaf once, and it had no effect on me. I believe the red pills contain mugwort (among other things) and the blue pills contain galantamine (among other things). Mexican calea, also known as calea ternifolia or “dream herb” is a species of flowering plant in the aster family. It’s sometimes used in Mexico to treat intestinal problems like diarrhea. People also use it to induce lucid dreams and to remember their dreams because it’s a natural oneirogen (it enhances dream-like states of consciousness). The leaves are smoked or brewed into a tea. It has a bitter taste, and can have some undesirable side-effects like nausea and vomiting. I’ve never tried it. Another oneirogen used to induce lucid dreams is African Dream Root. The Xhosa people of Southern Africa consider it a sacred plant and use it in their ceremonies. Like Mexican Calea, it’s commonly cut up and brewed into a tea. I’ve never tried this either, but I have friends who have. African Dream Herb is a large woody nut / seed about one inch in diameter. It’s also known as snuff box sea bean and cacoon vine (in Jamaica). It’s used in traditional African medicine to induce “vivid” dreams (although I haven’t heard of it specifically used for lucid dreaming) and to communicate with spirits. It’s common in many coastal places of the world, but not the Americas. The inner meat of the nut can be chopped up and eaten or ground into a fine powder and added to tobacco which is smoked just before sleep. L-Theanine is an amino acid found mostly in tea leaves. You can buy it as a supplement from health food stores to promote relaxation and stress relief without drowsiness. Unlike Mexican Calea, there are no known bad side-effects. Some people claim to induce OBEs by taking L-Theanine along with caffeine. I’ve tried it a couple times, but it never induced lucidity. I’ve never used cannabis (marijuana), so again, I’m speaking out of ignorance here. Some people claim marijuana encourages OBEs. Susan Blackmore had her first (and very lengthy) OBE after smoking marijuana.12 I’m not aware of any other authors who claim to use it for OBEs. Marijuana is considered a mild hallucinogen, so it interferes with normal processing of the TPJ. But as with all hallucinogens, can you really trust what you experience? Before you take any of these supplements, talk to your doctor about drug interactions and side-effects. Research the supplements and how they may affect you. Most of these over-the-counter supplements are not regulated by the FDA or other government organizations. In other words: PLEASE BE CAREFUL AND DON’T DO ANYTHING RISKY. OBEs are not worth risking your health. 6 The Phase, Michael Raduga, obe4u.com, 2015, version 3.0, pg. 155 – 156. 7 Melatonin is considered a prescription drug in some countries (e.g. Germany), but may be purchased over the counter in the United States. 8 Seeing Myself, Susan Blackmore, Robinson, 2017, pg. 196. 9 Out of Body Experiences, Akhena, Channel Soleil Publications, 2013, pg. 47. 10 Behind the Veil, Daniel Kelley, 2018, chapter 5, Dream Recall. 12 Seeing Myself, Susan Blackmore, Robinson, 2017, pg. 293. Recently someone in one of the Astral Projection Facebook groups asked for information on supplements that may be helpful for OBEs and/or lucid dreaming. This article is comprised of excerpts from two chapters of my as-yet-unpublished new book Hacking the Out of Body Experience. Due to the length, I broke it into two articles. In ancient religious, spiritual, and occult traditions, devotees obtained altered states of consciousness like OBEs only through years of meditation and hard work (or purely by accident). There were no shortcuts. There’s nothing wrong with years of hard work and meditation. There are still many purists who believe it’s the only “proper” way to achieve mystical states. Yet many of these so-called purists are already brain-hacking without even realizing it. They wake up every morning to an alarm clock: a device that artificially breaks their sleep cycle. Then they stumble to the kitchen and drink coffee: the brain stimulant caffeine. They listen to music on the car ride home from work: consciousness altering sound technology. They come home and use artificial lights in their homes: mind altering light technology. Then they stare into the artificial blue light of their cellphone to play a game before bed, which alters their sleep patterns. Yet they still think of themselves as purists. Indigenous people probably invented the first forms of early brain hacking: things like sweat lodges, trance drum circles, ecstatic dance, vision quests, starvation, hyperventilation and special breathing techniques. Later, brain hacks like hypnosis, Kaballah and Kundalini yoga were born. Some time later, healers and shamans seeking natural medicines discovered “brain hacking” plants that either caused powerful hallucinations (like mescaline) or unlocked expanded states of consciousness like ayahuasca, and psilocybin (magic mushrooms). The authorities of these societies quickly realized that if the common folk could induce their own mystical states and gain access to their own religious truths, they could usurp their authority and control. So they declared these plants “sacred” and locked them away from the common folk. They could only be used by shamans or the religious leaders as part of special ceremonies. They controlled the common people by keeping them in the dark. In the modern era, science and medicine have uncovered remarkable secrets of the human body and brain that enable us to take shortcuts. I like to think of these as “brain hacks” because to a computer guy like me, it seems a lot like computer hacking. In fact, many people like to think of the human brain as a kind of complex biological computer, but there are many differences that go beyond the scope of this book. I’ve done a fair amount of research on various vitamins, supplements, herbs and probiotics and their affect on OBEs and lucid dreams. In many cases I’ve tried these myself to see their effectiveness. Take a “Super B Complex” or “B-Stress” vitamin supplement that has a decent amount of B-6 every day. I have pretty good dream recall if I just take this every day and keep a dream journal. Take a larger dose Vitamin B-6 tablet, but never more than 100mg per day or it may cause liver damage. Don’t take B-6 every day. Take it for four or five days, then stop cold turkey for another four or five days, then go back on it again. For some reason, I seem to have better dream recall when I’m either starting or stopping vitamin B-6. If I’m on it too long or off it too long, the effect is nullified. So a “Super B Complex” is a better way to go. I currently use a B complex that has 50mg of B-6, 50mg Thiamine (B-1), 50mg Riboflavin (B-2), 100mg Niacin, 100mg B-12, 400mcg Folic Acid, 100mcg Biotin, and 75mg Choline, plus a few others. There may be a connection between OBEs and vitamin D deficiency. In my first book, I wrote that “Strangely, I usually have fewer OBEs in July. I suspect that’s because July is when I have the least amount of time to practice.”1 Making time to practice might be only part of the problem; the other problem might be more “normal” levels of vitamin D in my body. Let me explain. Vitamin D is very important for good health, but according to a 2011 study, 41.6% of adults in the US are vitamin D deficient.2 Many scientific articles associate vitamin D deficiency with sleep problems that affect sleep quality and quantity, including broken sleep,3 which is often associated with OBEs. Vitamin D is manufactured by the body from cholesterol when your skin is exposed to sunlight, which means it is also a hormone as well as a vitamin. Our ancient ancestors spent a lot of time outdoors, hunting and fishing for food, which means the human body evolved to require relatively high levels of vitamin D. Even a hundred years ago, most people spent many hours a day outdoors farming, which triggered solid vitamin D production. Today, many of us have a vitamin D deficiency because we spend most of our time indoors, out of the sun. Even if you spend a lot of time outdoors, exposure to sunlight in the colder months might not be enough. Here in Minnesota, November is the cloudiest month, averaging just 5 sunny days, and 6 partly sunny days, and the other days are cloudy. December isn’t much better. On the other hand, July is the height of summer in the Northern hemisphere, which means the sun is strong and the days are long, especially in my native Minnesota. People usually don’t have school commitments in July and take vacations from work, which often means they spend more time outdoors, exposing their bodies to sunlight, triggering the production of vitamin D. That might explain why I have fewer OBEs in July: OBEs might be exacerbated by vitamin D deficiency. It’s interesting to note that Michael Raduga, the champion of WBTB and broken sleep, also comes from a place pretty far North of the equator—Siberia—which also has long dark winters, so maybe many of his “Phase” experiences were also aided by a vitamin D deficiency. Do not try to deliberately starve your body of vitamin D for the sake of OBEs because that can lead to many serious health problems, such as depression. All I’m saying is that if you take a vitamin D supplement, it may artificially reduce or inhibit your ability to induce OBEs. I’ve experimented taking vitamin D supplements. In general, I really like how vitamin D makes me feel, but I definitely feel more “otherworldly” and OBE-prone when I’m not taking it. In chapter 6 I talked about our 90-minute sleep cycles and how nREM sleep is like laundering your brain, but that’s not the end to the story. Research suggests that taking raw potato starch before bed makes nREM sleep more productive (and therefore shorter).4 It’s like adding more detergent to the laundry. It gets your brain cleaner, but in less time. Technically, it acts as a probiotic, feeding the bacterium in your gut that produce short chain fatty acids (SCFAs) used to clean the brain. The bacterium produce two cytokines that regulate sleep. Since the length of the sleep cycles doesn’t change, when you decrease the amount of nREM sleep, you therefore increase the length of REM sleep, which means you have longer dreams. I’ve taken raw potato starch before bed several times. The bottom line is that I wake up in the morning feeling more refreshed, and I have longer and more vivid dreams. You can buy it in almost every grocery store in the baking aisle, or buy it online. What I recommend is one or two tablespoons of raw (uncooked) potato starch, dissolved in a glass of water. You may want to add a flavor squirt like Mio or Tang because it has a chalky taste, like bread flour. The herb mugwort (Artemisia Vulgaris) has a long history of medicinal uses. Many people call it the “dreaming herb” because it can cause strange dreams, flying dreams, and sometimes lucidity. In the past some people have associated it with witchcraft, but there’s nothing magic about it. It’s just ordinary chemistry. You can buy it from herbalists, a new age stores, and some health food stores. I’ve tried mugwort a few times. The first time I used one tablespoon of dried mugwort leaves in a quart of water. It seemed to have no effect. The second time, I doubled the amount and used two tablespoons, with about one quart of water. It gave me vivid nightmares, but in all fairness, they bordered on lucidity. The third time I followed the same formula, but once again it seemed to have no effect. Many people report success with mugwort for lucid dreaming, so try it yourself. To use mugwort, boil a quart of water, then add a tablespoon or two of dried mugwort leaves to water and make your own herbal tea. It helps to use a tea infuser ball, but you can also use a coffee filter and tie it at the top. Let the tea steep for at least 30 minutes before you drink it, and only drink it immediately before bed. It has a strange taste, but it’s not offensive. 1 Out of Body Experiences, Robert Peterson, Hampton Roads Publishing, 1997, pg. 218.